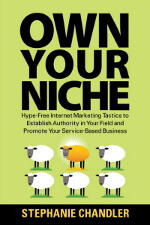 In late 2012 I decided to host a free ebook promotion where I gave away copies of my latest book, Own Your Niche, free of charge for three days. My goal was to give away 400 copies in three days. Over 72 hours, I was surprised to tall up over 1,000 registrations from users who downloaded the book, which far exceeded my expectations. There has been a lot of buzz recently about ebook promotions, specifically with Amazon’s KDP Select program, which allows you to give your book away to Kindle users for 48 hours. I chose not to participate in Amazon’s program primarily because Amazon requires exclusive distribution rights, which meant that I would have to cut off my distribution via Smashwords, which would prevent my ebook from being available for Nook readers, iPad users, etc. The other downside of promoting with Amazon is that you never know who downloaded your ebook. There is no email address capture or any way for the author to communicate with readers after the promotion is over. I set up a registration page on my site where visitors could fill out a form with their first name, last name, and email address. Short and sweet. My web designer created the form, which put all email addresses into a database that I could export and then import into my email marketing system. After registering, users received an email with a link to a page to download the ebook. I offered it in two formats: PDF or Smashwords. For PDF, they simply had to save the link to their computer. If they chose Smashwords, they had to go through the steps of purchasing the book with a free discount code. I offered up an extra bonus for readers letting them know that if they wrote a review in the next 30 days and posted it on Amazon, BN.com, Smashwords, their own blogs or social media sites, and then sent me a link to confirm, I would send them an additional nine bonus download items (reports, worksheets, etc.). Within the first day of this offer, I generated twelve sparkling new reviews. Added a Tweet button to the registration page so that users could easily tweet out a pre-written message: “Free Internet Marketing Book: Own Your Niche by Stephanie Chandler @bizauthor Grab your copy here: <link>”. Tweets were a big part of this campaign with tens of thousands of Twitter users reached. In part 2 I’ll cover what I would do differently and why I gave my Ebook away.